Is Knocking Century a great mile stone? Cricketers and Bloggers would agree unanimously. When my paternal die hard cricket fan thaatha (grand father) would take me to Chennai M.A. Chidambaram Stadium to watch cricket matches, as a ten year old I would jump screaming high to sixes and fours of Ravi Shastris and Kapil Devs alike. Till today I no nothing much about the game but what I liked the most was getting ready early in the morning with packed lunch and snacks and more snacks and ice-cream to be bought at the stadium and a whole day of watching different kinds of people enjoying their day. That was a perfect outing of a grandpa-grand daughter duo – chatting, munching, screaming, clapping and jumping through out – more work-out than those cricketers on the field. Today, I feel the same excitement when I jot down my 100th post. A big THANKS to all of you who’ve kept my pen writing. 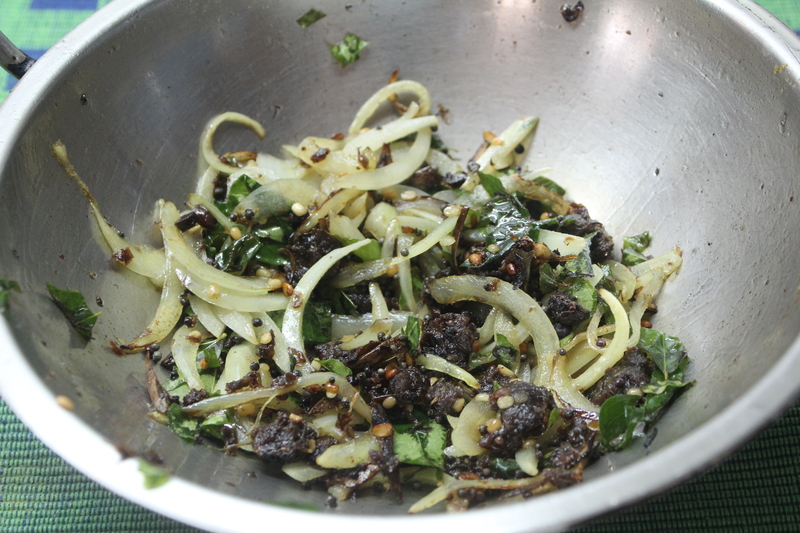 4. seasoned with mustard, dehusked black gram, curry leaves and vadagam (sun-dried onion seasoning). 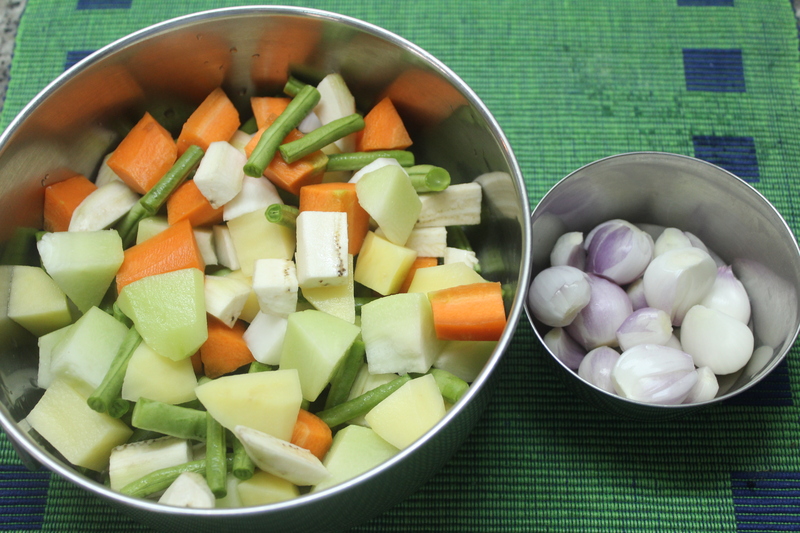 With the culinary world turning its eye towards One-Pot Meals, Kootanchoru is a healthy whole meal with high nutrient value; though with a long list of ingredients, it involves less time and work in cooking. 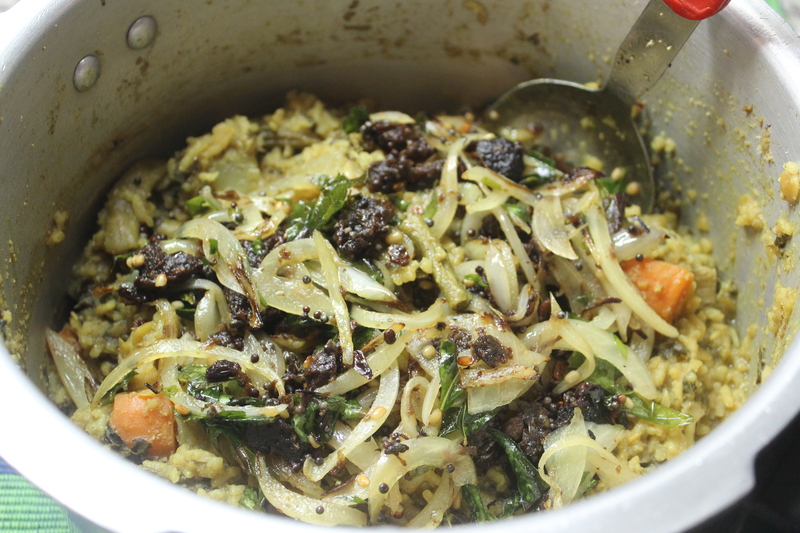 While the rice, lentils and vegetables are cooked in the ground spice paste, the house would be filled with a unique aroma – I call it the true flavor of THE TAMIL cuisine, common to every down south – Indian household. As I have mentioned, the ingredient list is elaborate, the initial preparation involves slightly more work, but the cooking proccedure is quite simple. The aroma and flavor of the meal is worth the effort of initial tasks!! PONGAL – the harvest festival of the Tamils (refer – https://dosaikal.com/thai-pongal-the-harvest-festival and https://dosaikal.com/pongal-in-cambodia/), is just five days away. 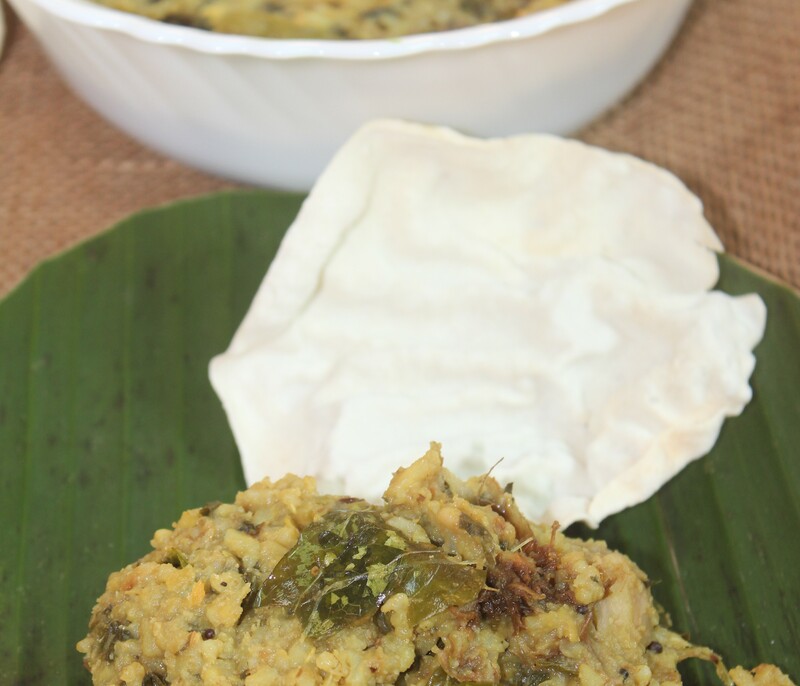 Kootanchoru is also a special meal during Kaanum Pongal or the fourth day of the harvest festival where people visit their friends and family and also spend the time on a Picnic. Kootanchoru can also be a picnic meal! While the joy of a 100 posts rekindles memories of my paternal grandfather who has also been a wonderful friend till he left us a year and a half ago, the word Kootanchoru reminds me of my maternal grandfather who would take us all grandchildren on different picnics and shower us with the delicacies of Thoothukudi. Coming from a family where the huge extended family, with maternal and paternal aunts (athais, chithis and periyammas) and those special aunts wedded to uncles (athais and chithis), I think each one in the clan are excellent cooks and my kootanchoru can never match their flavor of their hands; Or now in the next generation, the tasteful endeavors of my cousins – experts in variety of cuisines! 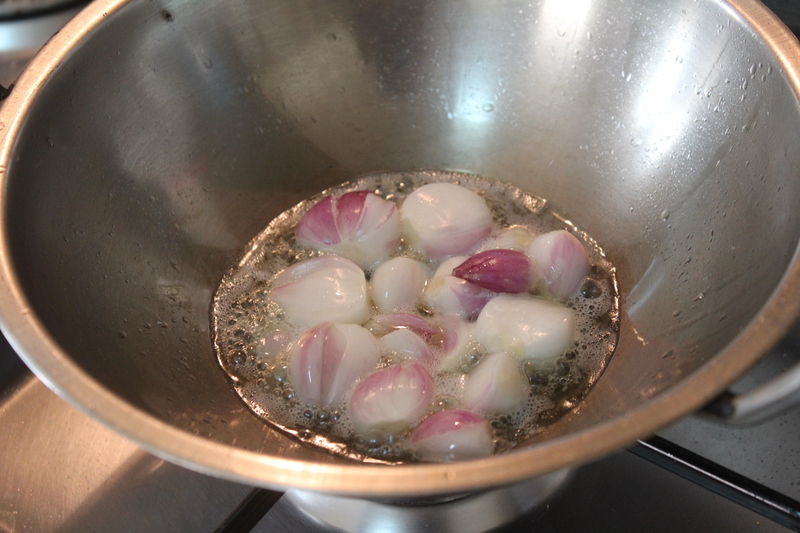 4. to grind – garlic is a key ingredient! pachai milagai/green chilli – 1 no. 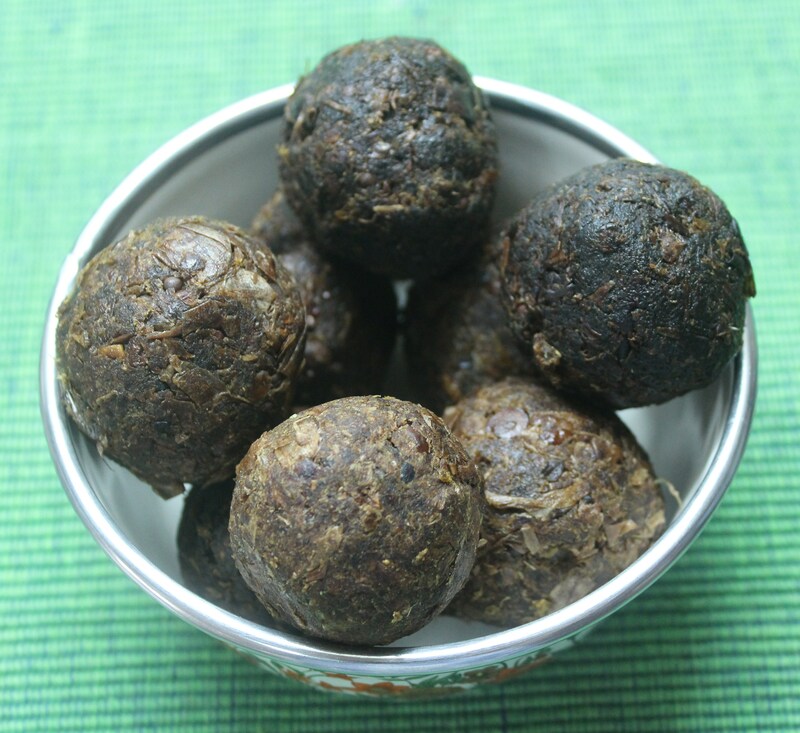 poondu/garlic cloves – 10 no. 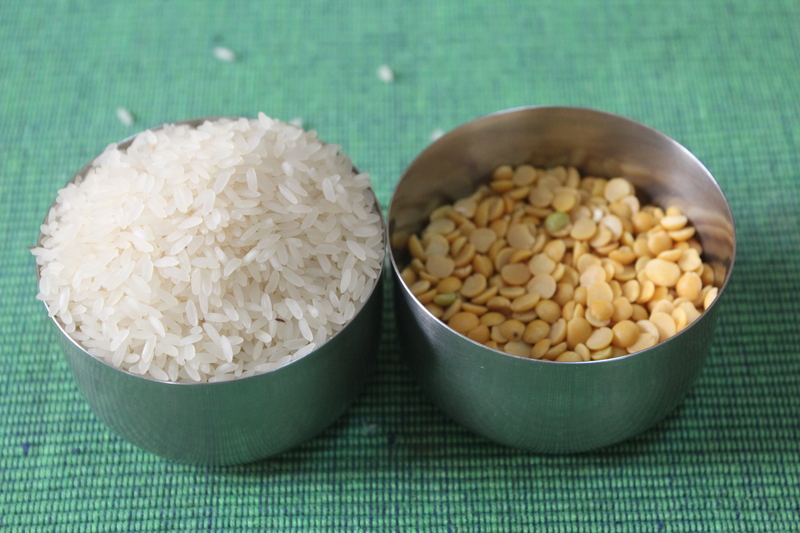 Add 4 cups of water for every cup of rice-lentil mix. I have used total 1 1/2 cups both combined – so I added almost 6 cups. This is not inclusive of the tamarind juice of 1/2 cup and the water content in the spice paste. A total of 4 cups for 1 cup is ideal. 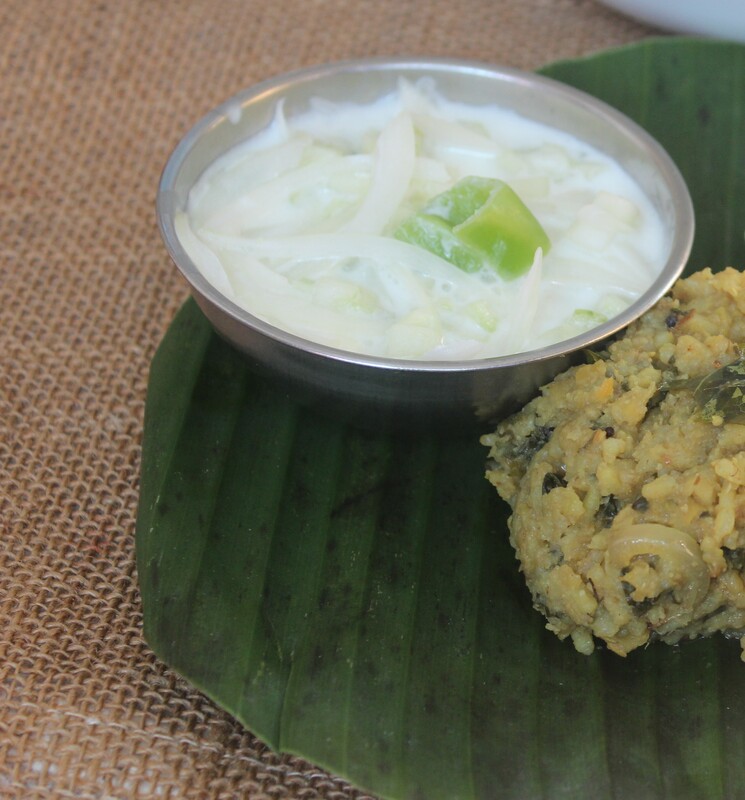 Parboiled Rice needs more water for a well cooked – semi mashed consistency and that is what is needed for Kootanchoru. 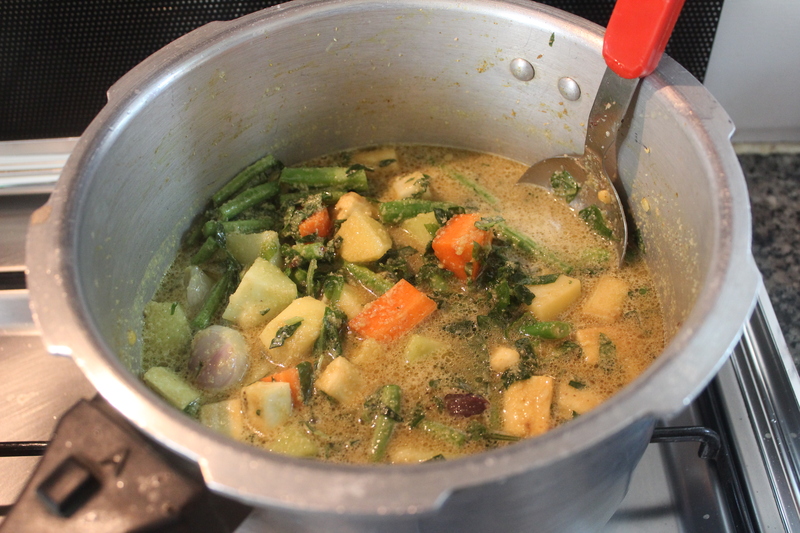 Open the cooker after 20 minutes; Kootanchoru is almost ready. 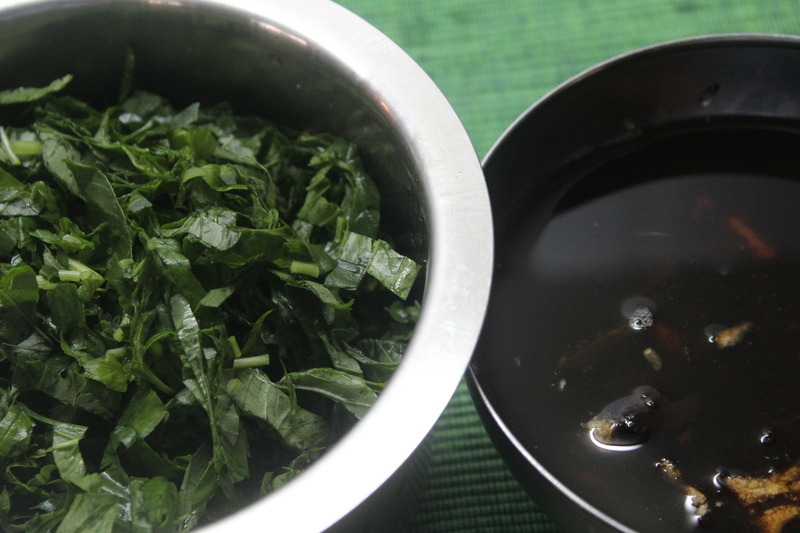 Kootanchoru is ready and tastes best with Thayir Pachadi and Appalam. a. Vadagams are sun-dried seasoning ingredients, stored for months at homes. 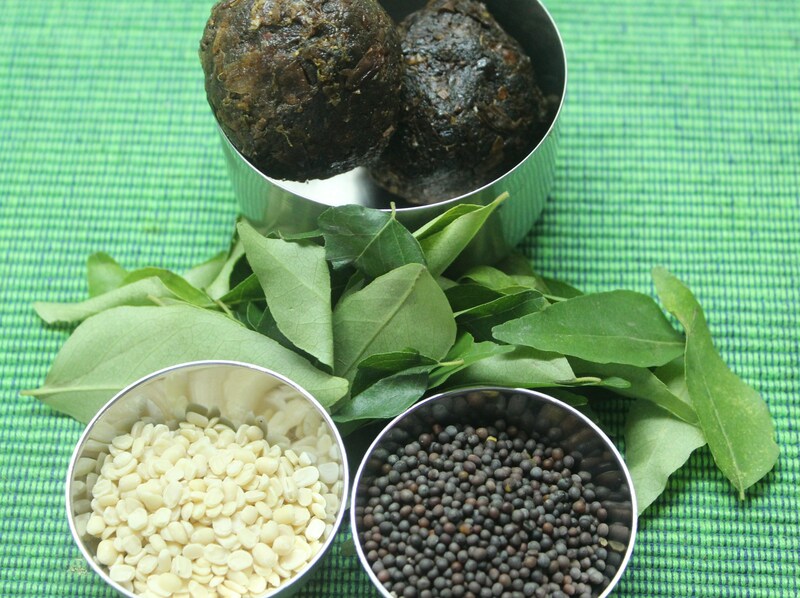 They may contain mustard seeds, dehusked black gram, curry leaves and onion. Variations depend on the family. b. In Thirunelveli, we have a different vadagam made of onions, not only used for seasoning but mainly had as accompaniment to thayir saadham/yoghurt rice as fritters (like the sun dried chillies). 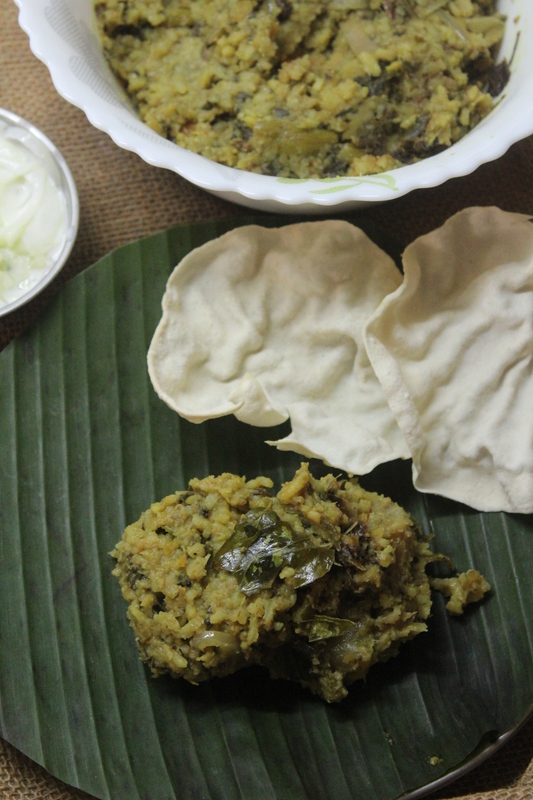 See – https://dosaikal.com/thayir-saadham-mor-milagaicurd-rice-sun-dried-chillies/. Since I did not have the original fritter vadagam, I have used the seasoning vadagam. 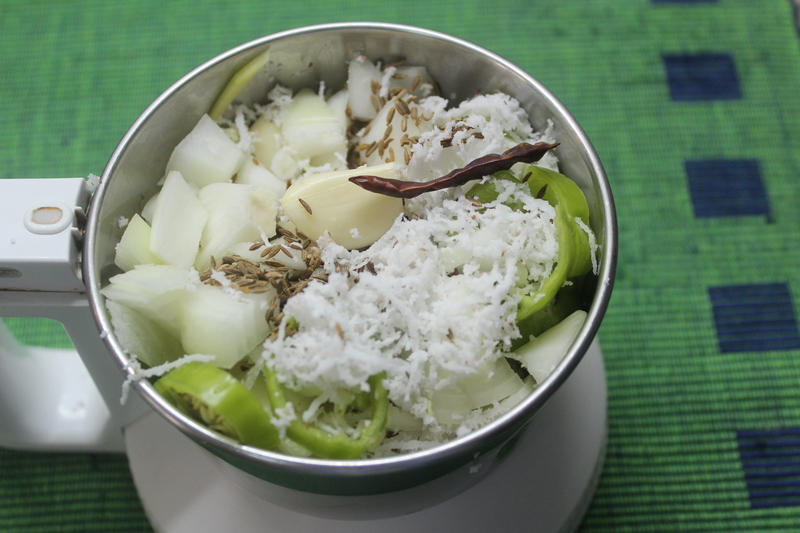 b. Typical/Original Pachadis have a coconut-green chilli paste added to the yoghurt base. What we have done is a simple one with yoghurt and salt alone as base. c. Since my daughter doesn’t prefer tomatoes, I used onions, cucumber and green chillies mixed in yoghurt and salt. a. Appalam is exclusively South Indian. In the North, they are called Pappads – made spicy too. Pappadams in south are another variety of discs which puffs up when deep fried. b. They are thin disc shaped fritters, made of dehusked black gram flour. There are also other varieties like rice flour appalams, jack fruit appalams and so on. c. They are deep fried or roasted on stove, nowadays microwaved and are had generally with a rice based meal. d. They can also be substitutes to vegetables on a lazy day. 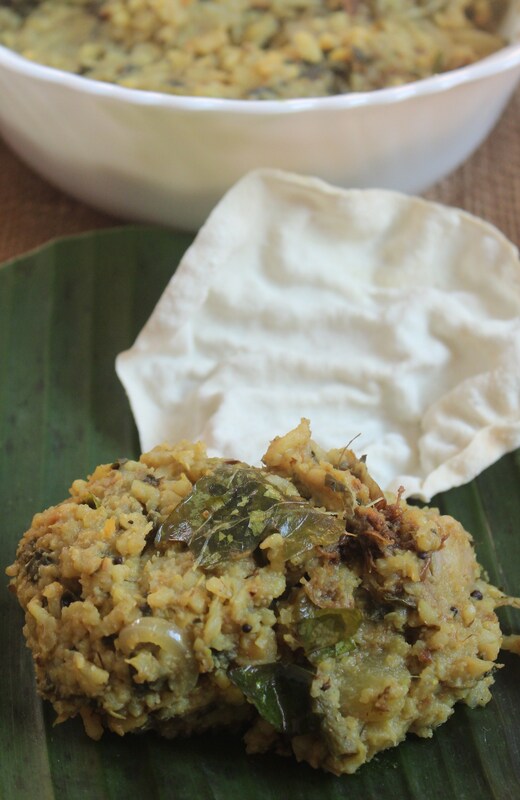 Kootanchoru is not only a humble and simple symphony of various ingredients, but one of the best aromatic and flavorful meals from the southern part of Tamilnadu. Do not miss the garlic to be ground with other spices. The flavor of garlic is one of the key essences to the flavour of this rice. Next Post Pongal In Cambodia – 2014! Congrats! Eagerly waiting for wonderful recepies like this in future too. Good luck. Thanks. Shall try to do my best. Great recepies! Happy Poongal to you & your family. Thanks Soniji, Happy Pongal and a very happy new year to you and your family. Congrats on your 100th post ! Happy Pongal !